Diamonds and white metals, mostly platinum, were the stars of the 88th Academy Awards red carpet jewelry presentation Sunday. Earrings were big with chandeliers, geometric designs and large drops. There were plenty of bare necks but when necklaces were worn, they were outsized and dramatic. The winner was Charlize Theron who appeared near the end of the event wearing $3.7 million worth of Harry Winston Diamonds. The show stopper was the 48-carat Secret Cluster Diamond Necklace, which was complemented by Winston Cluster Diamond Earrings, 15.49 carats, Cushion-Cut Diamond Ring with Micropave, 8.78 carats, Micropave Diamond Band Ring, and Queen Diamond Ring, 7.44 carats, all set in platinum. Prior to Theron’s arrival the top look was Naomi Watts’ who arrived early wearing a big, bold Bulgari diamond necklace. Rising expectations for Far East demand despite weak Chinese jewelry sales. Prices holding steady as sellers await outcome of Hong Kong show first week of March. Rough diamond demand firm during De Beers sight period. 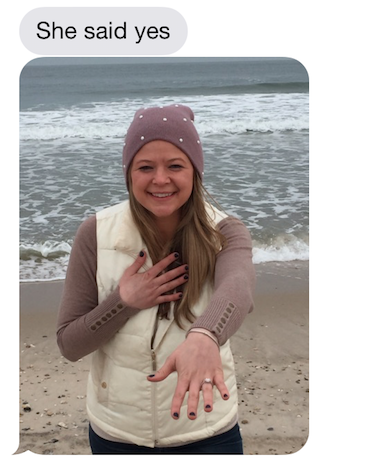 NYC Wholesale Diamonds would like to congratulate Danny Warner & Sarah Paulos on their romantic beach proposal at Ponquogue Beach in Hampton Bays, NY. We wish you both a lifetime of love and happiness! A ‘sign of the times’ article in this weeks issue of The New Yorker written by Amanda Cormier. These days, it seems like people just aren’t pairing up the way they used to. In our increasingly non-monogamous society, Valentine’s Day shopping can present certain problems. This February 14th, impress your loved one(s) with a jewelry gift that’s just right for him/her/them, with the help of this handy guide. For the person who just wants to keep things light. Labels don’t mean anything anyway. Work has been crazy lately. For the woman still reeling from a traumatic breakup, who is putting up a strong front. For the man who loves whiskey, craft beer, and adventure. For the person who is down. For the coastal hetero couple who said they’d get married when everyone in this country had the right to, but didn’t realize that things would move so quickly. For the man who will ask you to coffee as if it is a date, but it is not a date. He just loves conversation and pour-overs. For the man who asked for a copy of the house key only because he needs to lock up on his way out in the morning. He’s a freelancer, so he’s allowed to sleep in a bit. It’s a gig-economy accessory, not a promise ring. For the lady who wants to lock it down. For the woman who read “The Five Love Languages” and understood instantly that “Receiving Gifts” was her primary love language, but managed to convince herself that “Acts of Service” was more her style. For the woman who can talk identity politics all night long, if you only ask her, and who self-identifies as a witch. A marriage license is just a piece of paper; this ring is just a circle of cubic zirconia. For the self-aware co-habiting, committed, unmarried couple. Naughty! For the freewheeling woman without a care, who seriously doesn’t care. Like, at all. NYC Wholesale Diamonds’ founder and president, ​Keith Saxe, is GIA and FIT trained and has been a trusted high end diamond jewelry specialist for 28 years. 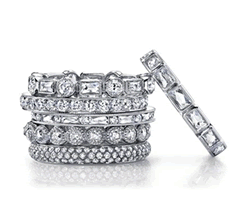 NYC Wholesale Diamonds is conveniently located at 47 West 47th Street, Suite 3A, in the New York City Diamond District. His website is www.NYCWD.com and he authors a blog www.NYCDiamondBlog.com. ​Keith has ​recently been named to The Diamond Council of America, is a member of the Jewelers Board of Trade, and Jewelers of America​. He offers GIA Certified Ideal Cut Diamonds,​ and state of the art fine jewelry designs at low wholesale prices. Keith has been named the N.Y. Diamond District’s Favorite Jeweler by the N.Y. Post’s Savvy Shopper column, had his diamond education articles published, been recommended in the New York Times, national gift reporter Robyn Spizman’s ‘Perfect Present Guide’ and ‘The GIFTionary’, as well as having his Diamond Halo Engagement Ring design featured on ‘The Knot’. 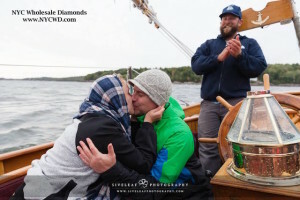 Congratulations to the very special couple from Maine who braved the rough seas all in the name of love! We wish you an eternity of happiness! Find the perfect diamond ring as this couple did by clicking on our exclusive Diamond Search Engine!